Hi ladies, finally after four years of trying to win the Glastonbury lottery, Alex managed to get us tickets for the biggest music festival in the world. He was lucky to snap them up in the resale in April and we spent an incredible weekend at Worthy Farm in Somerset on the last weekend in June. We joined 250.000 'chosen ones' for this years epic Glastonbury Festival and became 'campers' (Alex for the fifth time in his life and me for the first time). 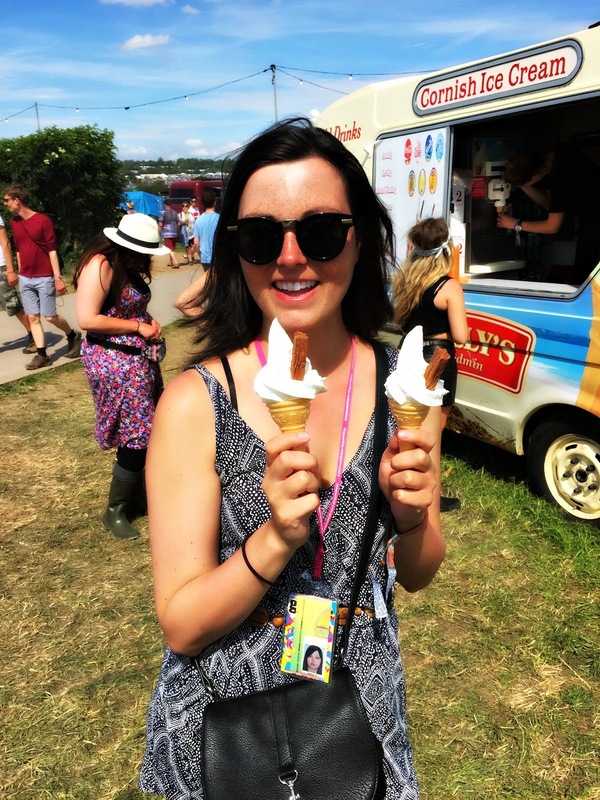 I'm going to split my Glastonbury diary post into two, so you'll see lots of pictures and all the bands we've seen. Having suffered from food poisoning the weekend before, it was for a long time not clear if I was able to go. I recovered very, very slowly from it and my stomach still felt a bit funny when we made our way over to Somerset on Wednesday morning. Alex woke me up at 5 am and we left our house shortly after 6 am. The drive was actually not that long. It took us around 45 minutes to Bristol and then it was another 30 minutes to the beautiful county of Somerset. The culture nerd I am, I've visited the small, sleepy town of Glastonbury many times before so I was super excited to come back to one of the most beautiful places in the world. We got stuck in traffic just after the motorway and the sunburnt already from the sky. It was forecasted to be sunny all weekend so I packed only five outfits and some warmer clothes for sleeping at night. I can tell you now, that I ran a bit short of clothes during the festival, so if there's a next time I'll definitely pack one or two more outfits. We arrived at the car park for around 11 am and sadly, we couldn't choose where to park. The system was allocated and guided otherwise we would have parked a lot closer to the festival site. We were in the outermost ring, so the way to the site was extremely long. Now, the most stressful and hardest part of the entire weekend started. 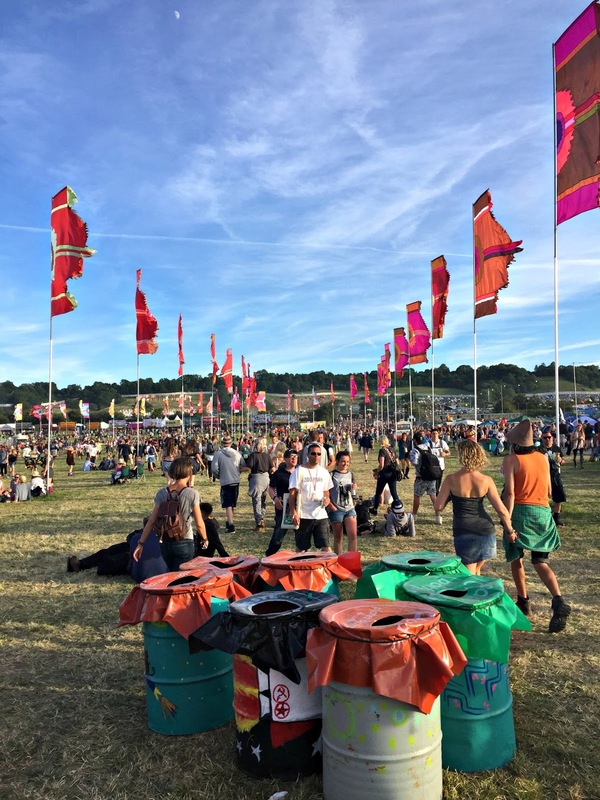 Alex mentioned that Glastonbury is huge and that there will be a lot of walking involved, but he didn't tell me about the thousands of people who would turn up with their trolleys, tents, even entire fridges full of drinks to run all over the place. Alex helped me to pack my bag and sleeping bags, he loaded his trolley with the tent and camping chairs and planned a second trip for later in the day to come back for the food. So we walked 15 minutes and joined a massive queue. It took us 2 1/2 hours to make it through the gates and I never had such a stressful time in my entire life. So many people, everyone was squeezing and then no shade but the burning sun. I mean I love hot weather but, not with hundreds of kilos packed onto my shoulders. I felt really sick and wished I would have stayed at home. When we made it through the gates, the real stress began. Finding a suitable camping spot. 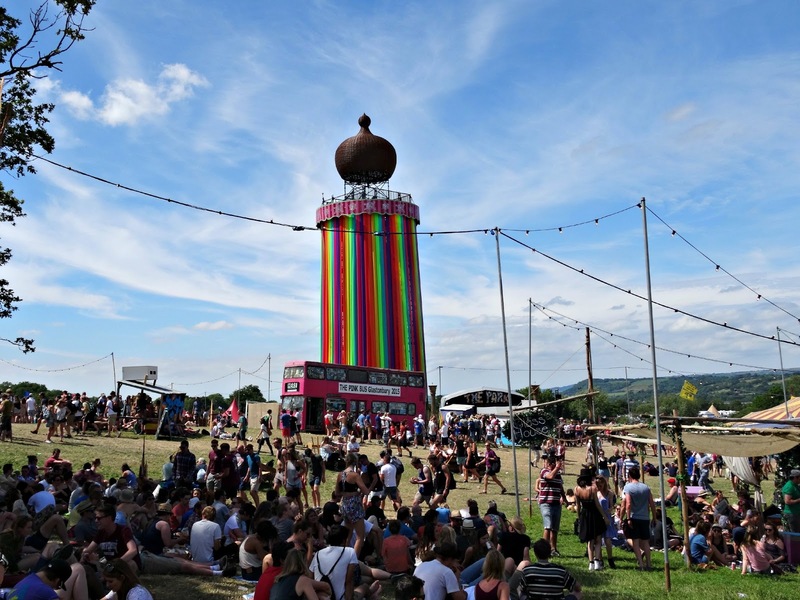 Alex has visited Glastonbury before, so his instructions for the perfect spot were somewhere near a water point, close to the site and toilets. He usually camped in the area close to The Other Stage so we took all our stuff across half the festival site. We walked past a few suitable spots but my Alex insisted on checking out his area first. By the time we arrived there, the area was fully taken. I got really tired and naggy, so Alex just got one of his camping chairs out and let me sit down. 'I'll come back for you when I found a spot, but it can take some time. Maybe an hour or so'. Well, that was fine by me so I sat down and waited for him to return. I watched people arriving, struggling with their tents or having a barbeque and I got a bit peckish. Alex returned shortly and surprise, surprise he went back to the spot I've seen earlier. So I took all of my stuff and went all the way back. The tent was half-way up so we decided to pump up the air beds to have a little rest. By then it was already 3 pm. Alex later made a second trip to the car to get the remaining food and drinks. His friends also arrived and he brought them back to our tent. When they were all set up we had a little barbeque and enjoyed the summery evening. The boys later headed to the festival's club and disco area Shangri-La and Arcadia whilst I had an early night. The first night was so cold. I slept with three layers of clothes but still felt like a massive ice cube. I warmed up in the morning when the sun burnt down on the tent. Today was all about exploring the site as there wouldn't be any music on until the next day. We all had breakfast and then made our way over to the music tents, food trucks and amusement parks. 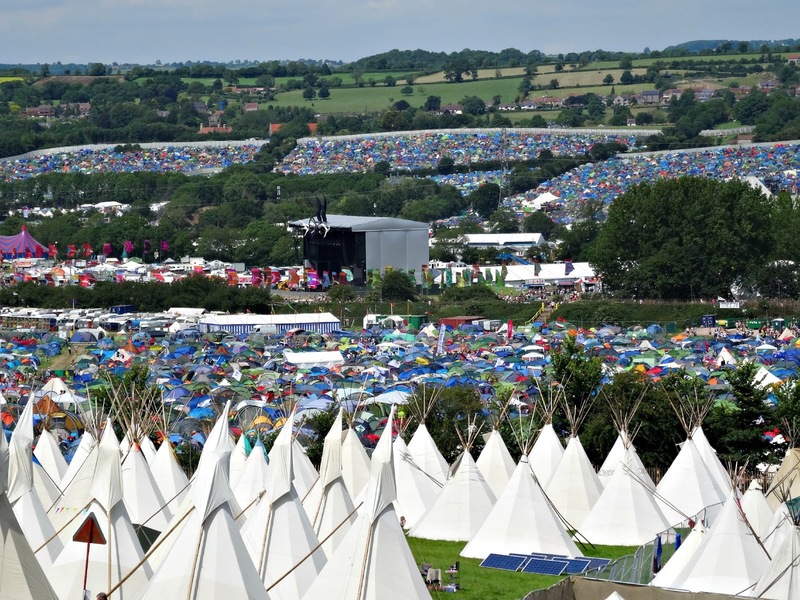 Glastonbury is huge. I've never seen anything like it before and I would best describe it as a small village but with the entire London population squeezed in. 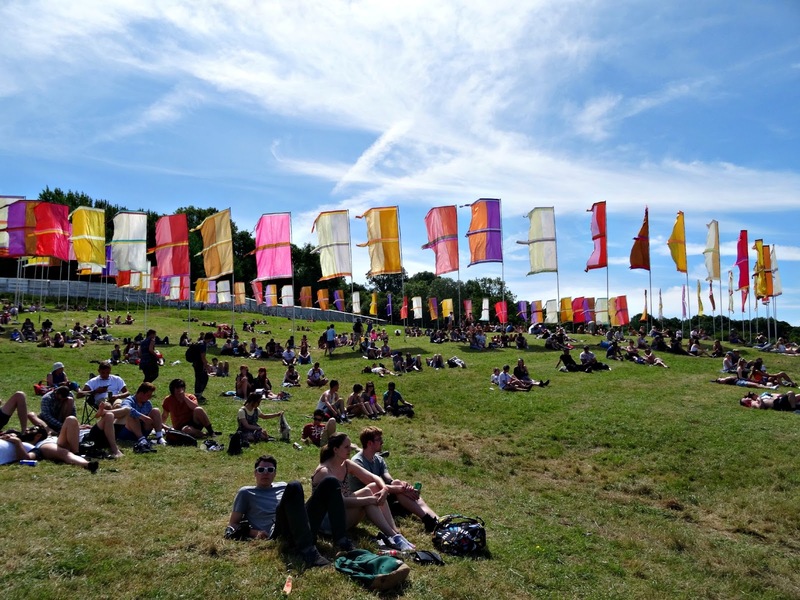 The site is divided into several sections and in between are camping areas, stages and music tents. Nearly everywhere are food trucks and crowds of people. Glastonbury has a lot to offer. 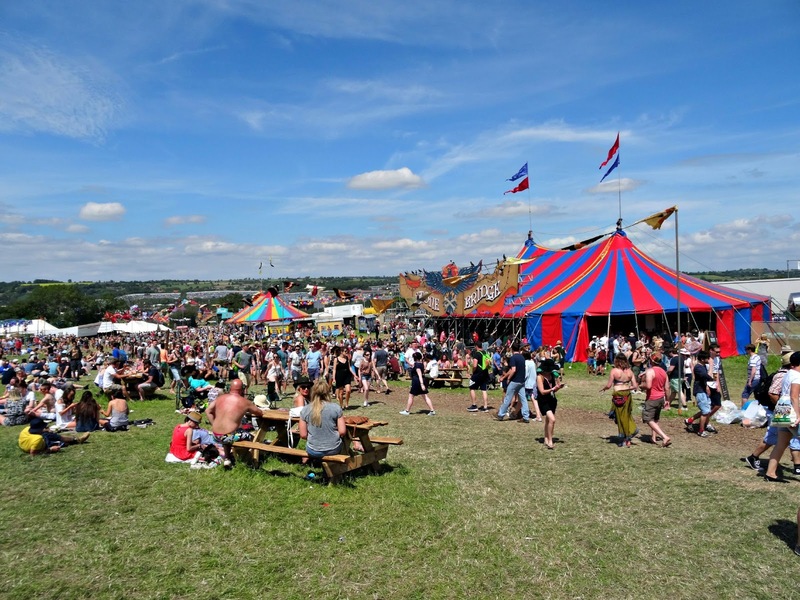 There are not only music tents and stages, they also have clubs, a cinema and fun activities. They have their own radio station and a Glastonbury Free Press paper with the latest news from the site. I liked that a lot because it contributed so much to the atmosphere and life on festival site. The Festival is hosted on a farm, so there were fields and hills on site. 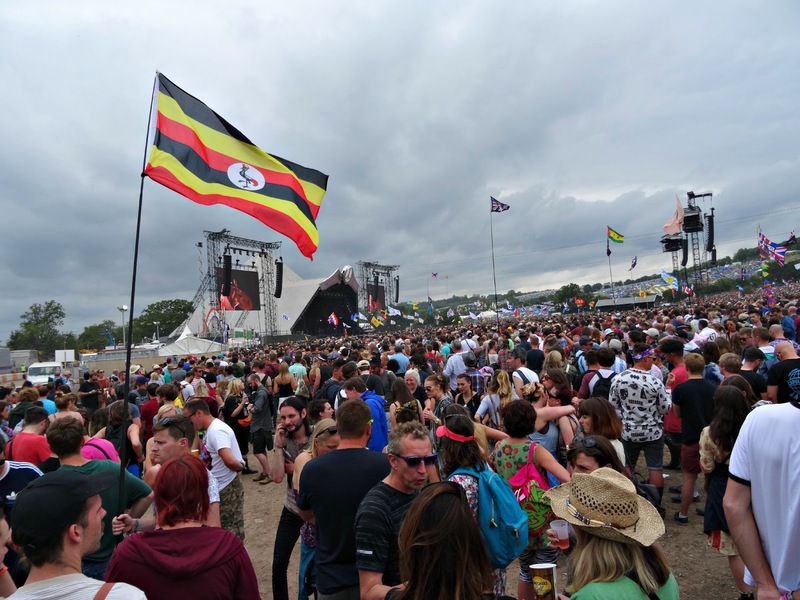 Alex and I made our way over to the flags and the famous Glastonbury sign and had a fantastic view from up there. To fully appreciate the panorama picture below, you should click on it to enhance it. My favourite part of the entire festival was an area called The Park. 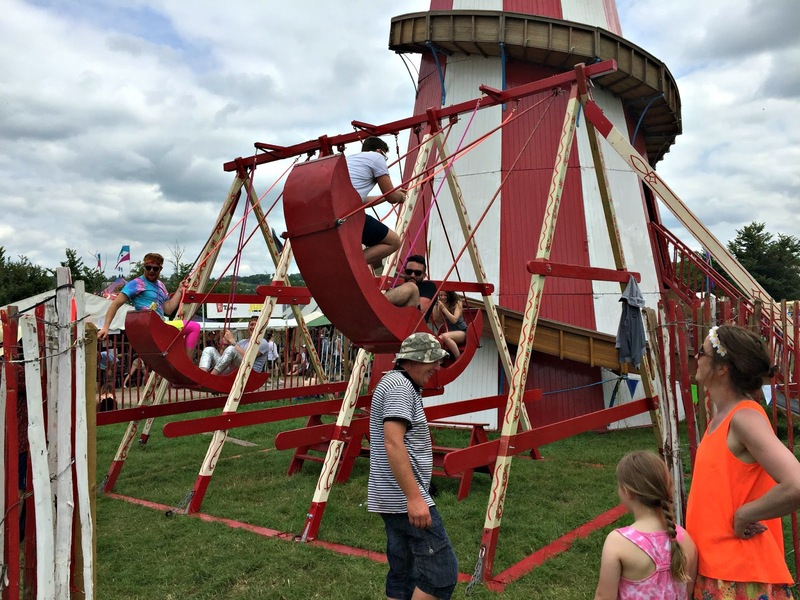 It was so colourful and happy with a lot of charm plus it had a viewing platform called The Ribbon Tower. The atmosphere was incredible although there were no bands playing that day. Seeing the entire festival site was an amazing experience. I've never seen anything like it before and just imagine how much time it must have taken to build all of this! The weather was fantastic so we sunbathed and ate ice cream. Towards the evening, we went back to the tent where we met our friends. We had another lovely barbeque and then headed to the furthest area of the site where all the clubs were (Block 9, Shangri- La, The Common). We ended up in a very bizarre club. Mexican death people danced happily around and it was a great atmosphere but so random! I slept a lot better that night as it was generally warmer in the tent. The first day of music, yeah! Friday started out really well. We all had breakfast and then split up to see all the bands. 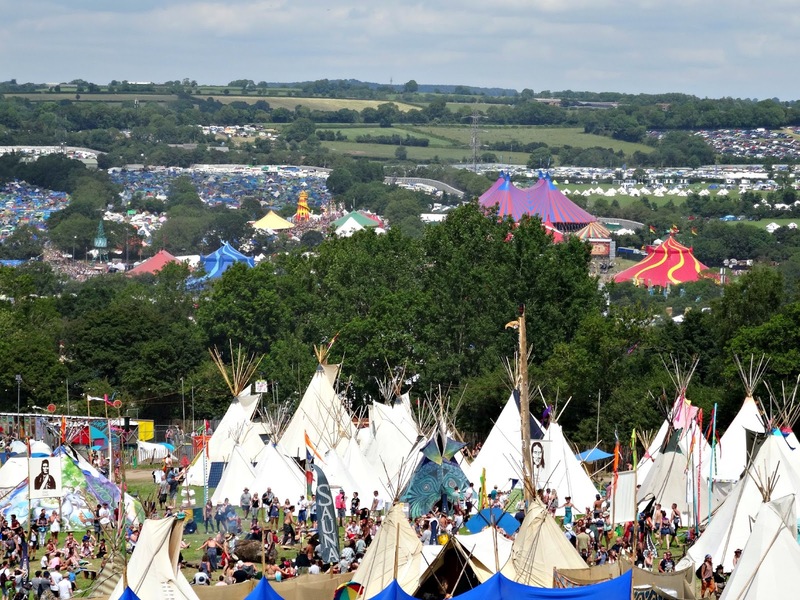 I wasn't too bothered about music if I'm honest because Glastonbury also lives from the atmosphere of camping and having a good time with your friends. I was a bit sad we all kind of split up but there were far too many people so it would have been a nightmare to stay together. We all went to see the bands we wanted to see and then would call or text each other where we were. I found it fascinating how people developed a sixth sense to find each other in that incredible crowd. Alex and I attempted to see our first act but I was a bit disappointed. I've been to festivals before but Glastonbury was so different. 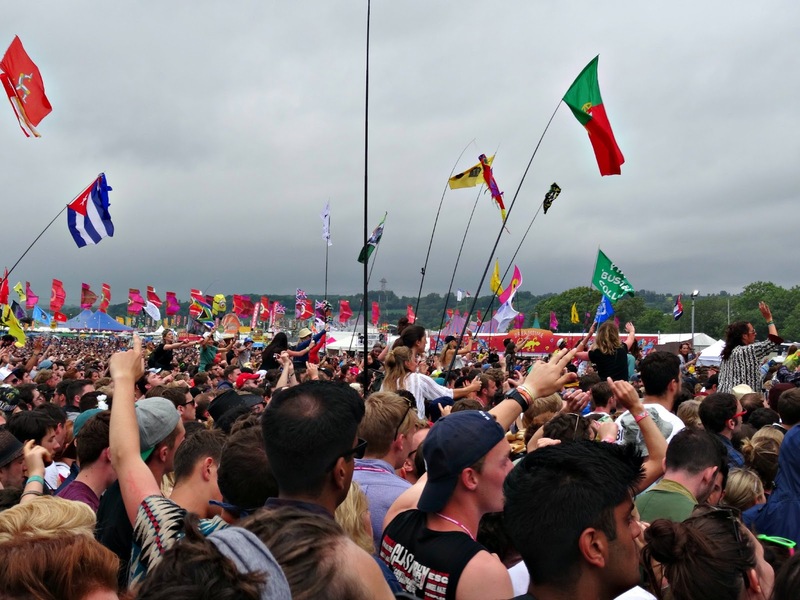 Thousands of people turn up for an act and if you haven't been to the venue at least 30 minutes beforehand, then you most likely have no chance to see the band as there are far too many people and you won't see or hear a thing. It took me a while to get used to that. 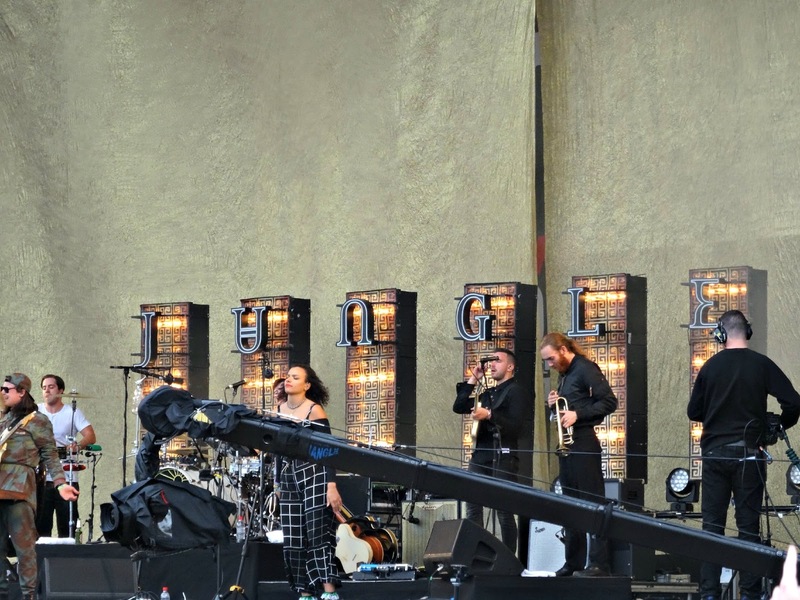 My only wish that day was to see Jungle so we made sure to be extra earlier at The Other Stage to see them play. 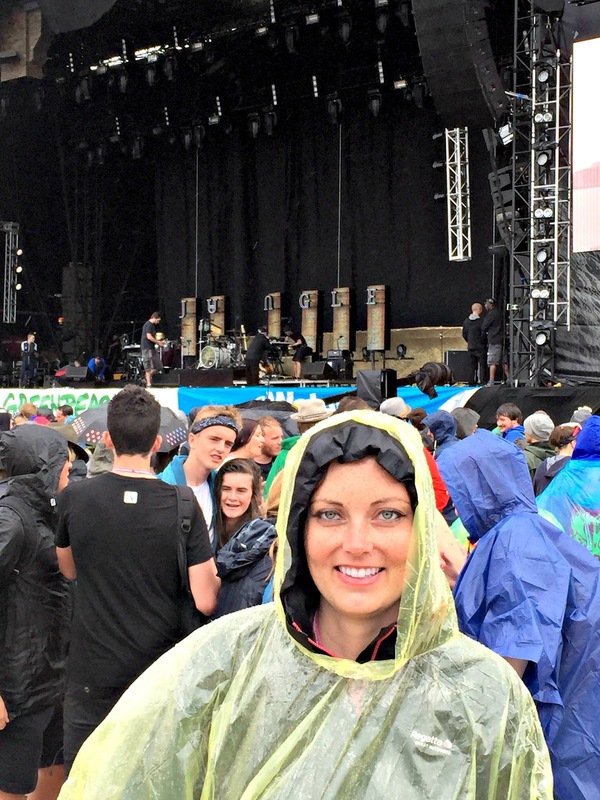 We watched the previous act 'Catfish and the Bottlemen' and it then started to rain. Jungle were fantastic! They were on stage for around 45 minutes and played my favourite song Time in a longer version. The crowd loved one of their break dancers: an 8-year-old kid came on stage and rocked that place with her performance. If you have the chance you should catch up on the entire show on BBC player. So, so good! 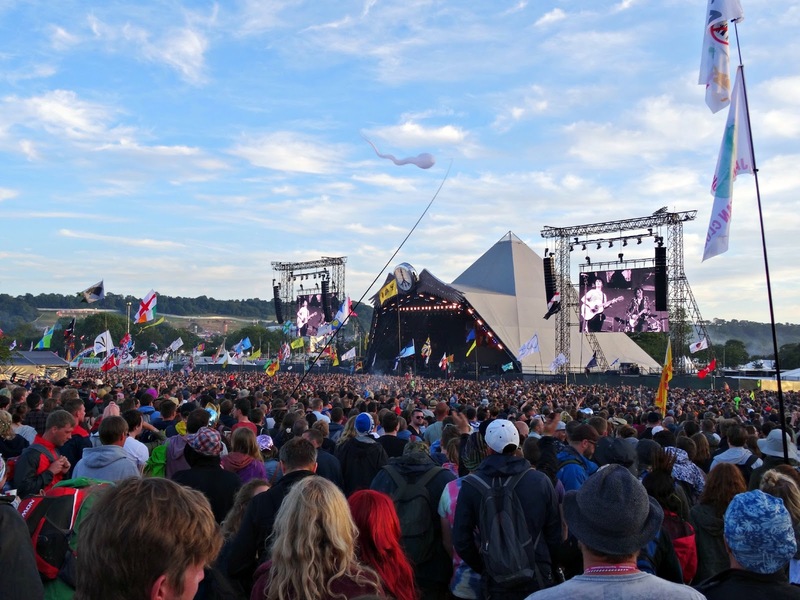 We then headed to The Pyramid Stage and watched The Libertines for a while. For the evening we decided to see Rudimental instead of Florence. Florence was asked to jump in and take over as a headliner as the originally booked Foo Fighters cancelled their performance. Many people moaned about it which I couldn't really understand. Florence is an amazing singer and her songs are definitely worthy to play on The Pyramid Stage. I was torn between Rudimental and Florence and in the end, we decided to see Rudimental over at The Other Stage. Rudimental live is a lot different to Rudimental on the radio. The bassline was extremely dominant and the singing sounded like a mere screaming. They've altered their songs to make them more appropriate for live performing, but they've cut out the best bits which I like to listen to. Overall I didn't really get the feeling that I usually get on my radio and I was gutted for days when people and the media raved about the magnificent show of Florence. Yes please stop rubbing salt into the wound! So here we go, the first three days of my Glastonbury weekend. 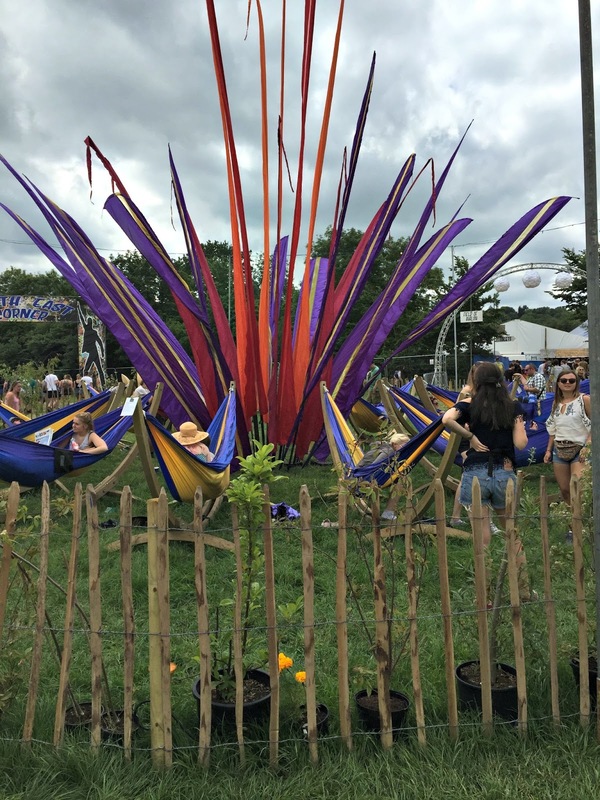 I'm going to publish the second part of my Glastonbury Festival 2015 summer adventure later in the month and I hope you've enjoyed reading my experience at one of the biggest music festivals in the world. 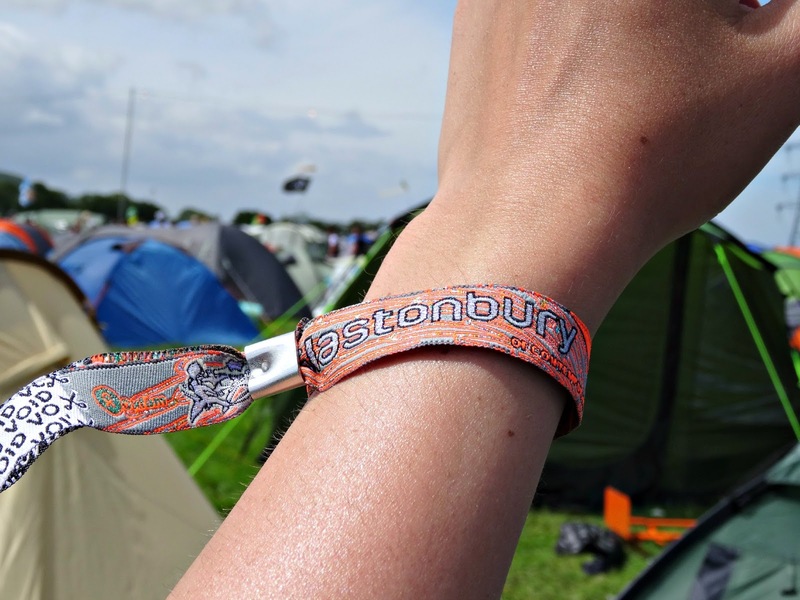 Have you been to any festivals this summer yet or are planning on going? 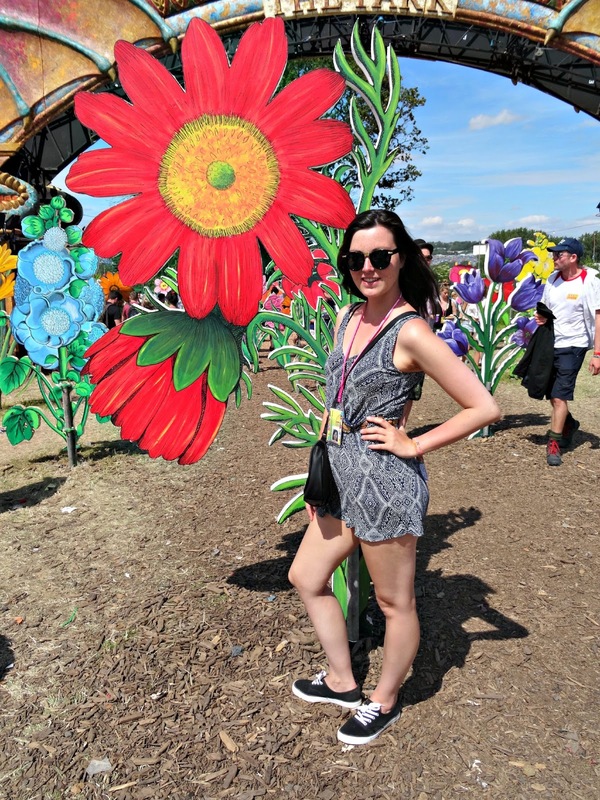 Did you go to Glastonbury and if so, let me know all about your incredible weekend. I'm looking forward to reading from you.